So when I wrote my first post almost a year ago I was just so excited about the thought of writing a blog that I never actually got around to doing it diligently. One week became two, and a month became four. By then, it was just embarrassing. But here I am once again, and this time I'm going to really try! So let's start off with something easy. One thing you'll learn about me as we go along is that I cannot stay away from a market. Any market. Now that it's August and the farmers markets are just full of gorgeous tomatoes (a little less so this year...), corn, and stone fruit, I try my best to cook with these freshest of ingredients. Tonight, it was the tomato, and boy, was it worth it. Sam and I wanted something easy after an afternoon of museums and a round (or two) of drinks with my parents and friends. So Balsamic Chicken it was! This is the easiest and one of the most delicious ways of cooking chicken and is one of Sam's specialties-so I let him handle it! 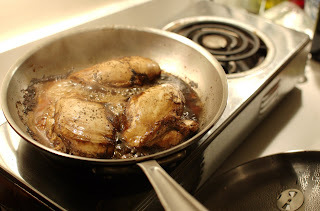 Heat up the frying pan and pour in the vinegar. Place the chicken in the pan, add salt and pepper liberally, and cover. Cook for 1 minute on each side , then let cook (covered) for 10 minutes, turning occasionally. Remove from pan once the juices run clear when the meat is cut into. For the tomatoes, I had some day old bread and tons of basil, and since we were already making Balsamic Chicken, I whipped up a quick bruschetta. Chop the tomato into cubes, mince garlic, and chop the basil. Mix together in a small bowl. 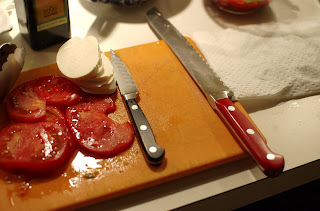 Pour oil and vinegar over just until it just coats the tomatoes lightly. Add salt & pepper and let sit. Toast baguette slices and let sit. In the meantime, I also prepared a small "caprese" salad with the rest of the tomato, a few slices of good mozzarella, and additional basil leaves. A little oil, balsamic vinegar, salt & pepper and you're all set! 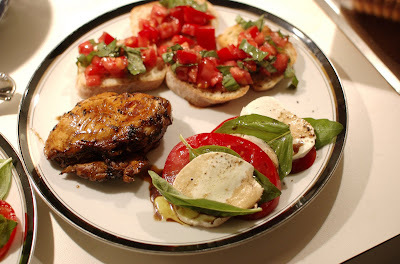 Once the chicken is done and you're ready to plate, place a spoonful of the bruschetta topping on each slice of toast and finish the whole plate with a little ground pepper. The whole process takes no more than 35 minutes and is a nice way to end the weekend. By using so many similar ingredients, you save space on your counter, and on your shelves. And the best part of this meal is that you can cook an extra chicken breast and have an incredibly flavorful addition to a salad for lunch on day! I made the balsamic chicken tonight and Hotplate Confidential's directions were just perfect. Delicious, moist, flavorful, simple! Thanks for the inspiration.